Researchers believe there are only 11 or 12 individuals left in B.C. Researchers believe there are either 11 or 12 individuals left in B.C., among them four or five females. 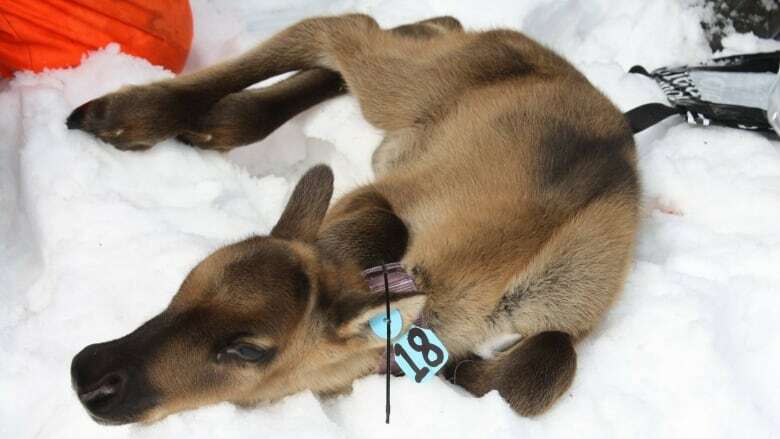 Holger Bohm, the fish and wildlife section head for the Kootenay region, said that a "maternal pen" is now being set up to protect young caribou from predators when they are at their most vulnerable. The caribou calves will remain in the enclosure until they are about one month old, at which point they'll be free to leave the pen area. "We're really addressing the critical period [when] the newborn calves can't follow their mothers quite yet," he said. "We're trying to take that early predation out of the equation to give newborns a fighting chance." ​Bohm said the decrease in the population has been drastic. In 2009, there were an estimated 46 caribou in the South Selkirk region, nearly four times the current number. "We are, of course, hopeful, because, otherwise, we wouldn't do this. But in all fairness, this is the last chance. It seems like with only 12 animals on the ground, this is really pulling all the triggers we can and trying to do the best we can to keep their population alive," he said. "If this doesn't work, I'm not sure what else we can do," he said. The pen, set to be built later this fall, will be located east of Ymir, within the darkwoods conservation area and will not be open to the public. It will enclose about 20 acres of prime caribou habitat and be surrounded by a 4.6-metre high fabric barrier strung between trees. Electric fencing will also be installed around the exterior of the fence to prevent predators from entering the pen. The initiative is being co-ordinated by members of the Selkirk Caribou International Technical Working Group (SCITWG), in collaboration with the province and the Nature Conservancy of Canada. Maternal penning has been successful in B.C. before. According to the province, it previously helped stabilize the caribou herd near Revelstoke and has increased the herd in the South Peace. In 2013, the Klinse-Za caribou herd in northeastern B.C. was down to just 16 members. But as of May 2016, that number was up to 61, thanks to the conservation efforts of local First Nations. But, according to a federal government progress report released Tuesday, nationwide efforts to restore caribou habitat and herd numbers are falling short. In 2012, the federal government found 37 of Canada's 51 boreal caribou herds were not self sustaining, with wildlife scientists predicting they could decline by 30 per cent over the next 15 years. Provinces were given five years to develop habitat protection plans under Canada's Species At Risk Act. All Canadian provinces missed the Oct. 5, 2017, deadline, though B.C. has released a draft plan.